Sonam Gyatso (Tib. བསོད་ནམས་རྒྱ་མཚོ་, Wyl. bsod nams rgya mtsho) (1543–1588) — the Third Dalai Lama. Recognized at the age of four he was taken under the care of Drepung Monastery of which he became abbot at the age of ten. His education was supervised by Panchen Sonam Drakpa. In 1577 he was invited to meet Altan Khan (1507-1582) of the Tumed branch of the Mongols. The Khan gave him the title of 'Dalai Lama'. 'Dalai' means 'ocean' in Mongolian which is Gyatso in Tibetan, and this has been included in the names of all the Dalai Lamas since then. Sonam Gyatso publicly announced that he was a reincarnation of the Chögyal Pakpa (1235–1280) who converted Kublai Khan (1215–1294), while Altan Khan was a reincarnation of Kublai Khan, the famous ruler of the Mongol Empire and Emperor of China, and that they had come together again to cooperate in propagating Buddhism. After meeting the Khan, Sonam Gyatso travelled throughout Kham, performing miracles and teaching the Dharma. In 1583 he founded Kumbum Monastery at the place where Tsongkhapa had been born. Altan Khan again invited him to Mongolia, but by the time he arrived the Khan had died. Nonetheless he continued his travels in Mongolia, teaching the Dharma, until he fell ill and passed away in 1588. 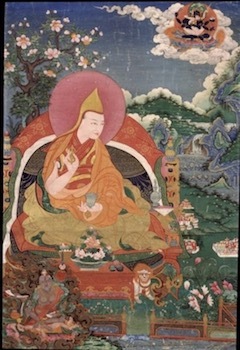 During his lifetime the Gelugpas greatly increased their sphere of influence in Tibet and the spread of the buddhadharma in Mongolia, started by Sakya Pandita, was given fresh impetus. ↑ Thomas Laird, The Story of Tibet: Conversations with the Dalai Lama (Grove Press, 2006), p.146. This page was last edited on 13 January 2018, at 01:38.